Art comes in countless varieties. It can be quite a lot, like Michelangelo’s Sistine Chapel, or come across as more or less nothing, such as a row of pavement stones by Carl Andre. An artwork can be the result of years of labor, but can just as well derive from a sudden inspiration where the realization hardly took any time at all. The investment of time, energy and cost of materials tells us nothing about the quality of the work, and the discovery of minimal art shook the art world as profoundly as the biblical story on that famous ceiling. But usually art falls somewhere between these extremes, created on a human scale, making no great demands for art philosophical insights. The observer can, without much effort and uncertainty, basically grasp what it’s all about. Such is the case with the work of Jan De Pooter. His most recent work is a big boat, made from salvaged planks which he has treated with a delicate layer mixed with sand, giving it a rather weather-beaten effect. The vessel stands supported, as if in a dry dock. Gallery Dagmar De Pooter is thus filled up and appears as some kind of transported wharf. The boat stands pointed in the direction of the street, with the Schelde near by. Can this boat sail? No, although it would remain afloat much longer than the “Scotch Gambit” by Panamarenko. But it doesn’t actually need to be sea worthy, because it’s not a boat but a work of art. As such, it’s an idea, a concept, an expression. It represents something which cannot be put into words. L'invitation au voyage , perhaps, as in the famous poem by Baudelaire. In order to better understand what this is all about, it’s advisable to go over some other works by this same artist. In the 1990s, Jan De Pooter principally exhibited bird houses and suitcases. These, too, are connected with travel. The fanciful bird houses often had rather bizarre proportions. When placed in his garden, the occasional bird might pass by, but wouldn’t linger. This was never their intended purpose. One of the bird houses was made from a suitcase. I believe they were intended for migratory birds, large migratory birds. As for the suitcases: at all times and in all places, people are en route somewhere, either voluntarily or under duress, towards a safe or uncertain destination. They all have their baggage in tow, practical suitcases from Samsonite, Delsey and Laurent David, chic suitcases from Pierre Cardin, YSL or Vuitton, improvised third-world suitcases, or simple cardboard boxes and plastic bags bound with string. Tanned and self-satisfied, or battered and in despair, they pile into airports and bus terminals hoping to reach their destination unscathed, to experience kindness and generosity, open doors awaiting them. The search for good fortune and security is the mark of both the tourist and the refugee. The suitcase represent a desire to be elsewhere. But Jan De Pooter also makes suitcases out of concrete, which are unmovable. These suitcases are like a ball and chain, you’re held down, you can’t make a move with them. The seduction of adventure becomes an obstruction and frustration. Or he attaches a suitcase handle to a wall, a beautiful metaphor for the feeling of being locked up, the impossibility of departure, the illusion of mobility. But at the same time, the profound idea that you always bring yourself with you, wherever you go. With that handle you transport yourself as if it were your own room. With dozens of suitcases he built a meters-high gate, which by itself already seemed to be some kind of touristic monument, a postcard image. And just as you had grotesque birdcages, you also have grotesque suitcases. In one of them was squeezed a blow-up toy shark. Attached to another were musical horns (those annoying old-fashioned car horns, fortunately banned long ago). With these suitcases you can place yourself on display. Far more impressive than a suitcase covered with colorful souvenir travel stickers. In this manner, Jan De Pooter appears to relativise his own work. He begins with an idea with a particular set of possibilities, carries them out in a series of variations which enrich and clarify the idea, then wraps them up with cartoonish touch. The work takes on a Tex Avery-esque quality, as he himself puts it. Additionally, there’s his curious penchant for public water closets, particularly urinals. In 1995 he began to take photos of them, which lead to a touristic map of the city upon which, instead of the locations of museums and other culturally edifying sites, only the public toilets were indicated. The work of a man of the street, a repudiator, an exile. This concept, too, was brought to a farcical conclusion, in the form of a portable and folding urinal, which one can be hung around the neck in order to, in all discretion and surrounded by bewildered bystanders, allow the call of nature to take its course. Jan De Pooter appears to be drawn towards desires and illusions, but the dominant theme in his work is in a sense quite realistic and down to earth. All of these illusions are not his own. His work does not come across as exceptionally laconic. He says himself that the only “fresh” work he’s ever made is a bathtub, filled with blue water, in which, under the water line, a copper boat portal is mounted. It is indeed a truly artistic idea. Imagine you’re in the bath and stick your head under water: you suddenly have the feeling of being in an underwater yacht, or some kind of home submarine. Everything seems to go well, as long as you don’t believe too strongly in this illusion and attempt to open the portal. The result would be that the bath water would immediately drain and you’d have to go mop it up. Which brings us to the imposing black boat, that nomadic dream project he has challenged himself with. You don’t load this leviathan casually on a ‘remorque’, as you would a sailboat from a boat shop. This is the project of a great tinkerer, who knows how to take on a hundred and one technical problems. Mounting, dismounting, transporting, remounting, storage. The spectator takes it all in. His ship has something somber about it, something inaccessible. The Ship of Doom! 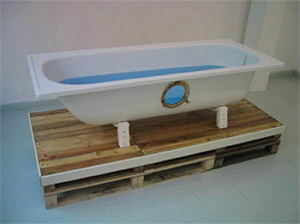 Le Bateau Lavoir! La Lugubre Gondola! You can make it as romantic or dramatic as you like, but in no respect is this a vessel for a summer pleasure cruise along the Galgenweel. Whoever wishes to travel with this will have to be satisfied with the most rudimentary of comforts and place his fate in the hands of its builder-captain. But that trust is generated by the boat itself, for at the same time it has something solid and life asserting, as well as a certain sensitivity, and it is the combination of these qualities in which all of its emotional meaning is suggested. But at the same time, in all seriousness : Back to Basics. A child with a balloon (we assume this child has already seen a balloon burst) is careful with his balloon, and expertly maneuvers between sharp projectiles and glowing cigarette tips. He knows that the balloon is but a frail illusion, but wants nevertheless to enjoy it for as long as possible. The child discovers that his cautious protection of the balloon doesn’t detract from the pleasure it provides him with. So too with the boat: it floats on the waves, so long as you don’t put it in the water.